You probably already know that there are many forms of sugar and if you’re watching your sugar intake it can be hidden in places you might not have expected it to be. You can get sugar from sugar beets, sugar cane, and from corn in the form of corn syrup. We also use maple syrup, molasses, and manufactured sweeteners to flavor our foods. And new sugars have shown up on marketplace shelves. There’s Stevia and Agave made from plants as well as coconut sugar which is a sugar produced from the sap of flower buds of the coconut palm. None of these sugars has the same health and nutrition properties that honey has. Honey doesn’t have any fat or cholesterol. 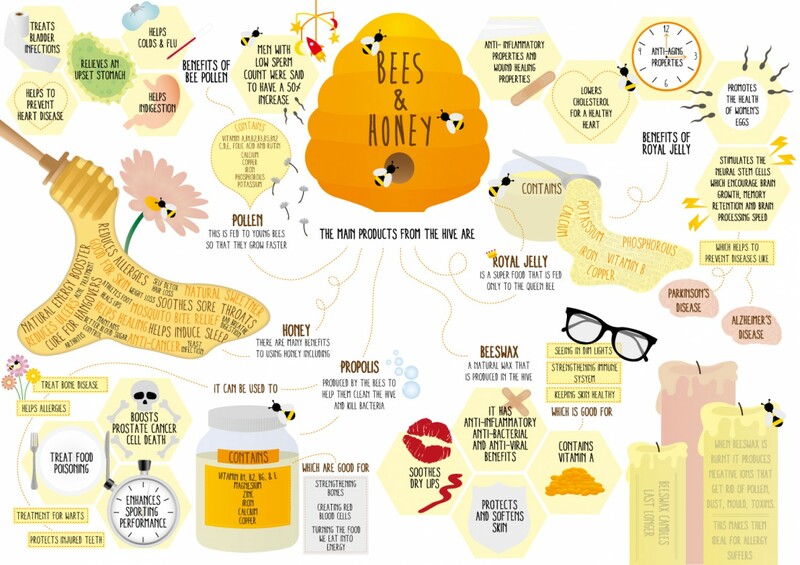 In addition to having a significant number of nutrients and minerals, honey has other health and healing properties…. Your body turns food into glucose which it then uses to create ATP for energy. Honey is already broken down to a very basic level which means that your body can use it almost at once. It doesn’t have to go through a lengthy digestion process, like a sandwich might, to become energy for your body. In fact, your body can begin converting honey immediately. This means it’s a fast source of fuel for your body, which can be particularly important if you exercise. Honey is a fantastic pre or post workout snack and many endurance athletes consume honey during their workout to provided sustained energy. There are now many sports nutrition products made from honey because it is so easy for your body to manage and healthy too. Honey has a low glycemic index, which means it doesn’t cause a spike in your blood sugar levels. This helps manage your insulin response and give you energy without the sugar rush associated with most sweeteners. Additionally, honey has been shown to possess some healing properties. Hospitals in Israel studied the effects of honey on the immune system. They found that it was effective in decreasing the occurrence of acute febrile neutropenia in 64% of their patients. Acute Febrile Neutropenia is when a high fever reduces a person’s white blood cell count. In the same study honey also stabilized hemoglobin levels and improved the quality of life in 32% of the cancer patients involved in the study. Honey also has many healing properties. It is both an anti-inflammatory and an anti-bacterial. It’s commonly used to alleviate sore throats. As well, you can use it as a cough suppressant instead of cough medicine. A spoonful of honey will coat the throat and reduce pain and soreness. As well, a 2007 study by the Penn State College of Medicine, found that honey offers a safe and effective alternative to children’s cough medicine. They studied the effects of buckwheat honey given before bedtime and found that it provided better relief of nighttime cough and sleep difficulty in children than no treatment or dextromethorphan (DM), a cough suppressant found in many over-the-counter cold medications. And honey, when given to children over the age of one, has no harmful side effects unlike Dextromethorphan.